Few businesses were more important to Oregon pioneers than the local grist mill— area farmers hauled their wheat crops by wagon to have their harvest turned into the flour that sustained them for another year. 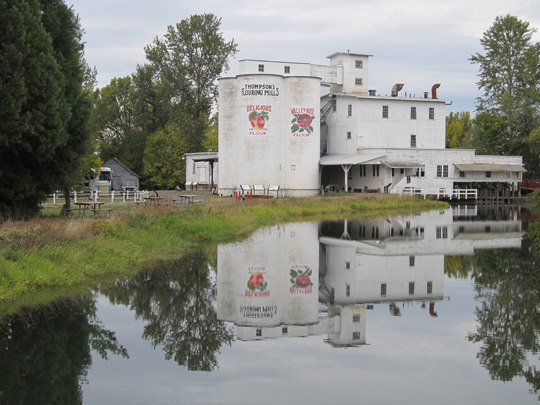 If you’d like to tour Oregon’s oldest surviving water-powered mill, head to the tiny rural town of Shedd. A visit to the 157 year old flour mill at Thompson’s Mills State Heritage Site is a step back in time you can take today. 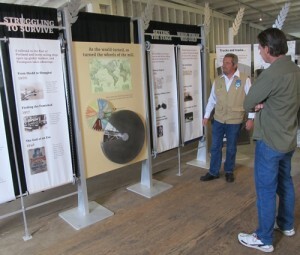 FREE guided tours are led by knowledgeable volunteers who demonstrate many pieces of original equipment. You’ll learn the efficient step-by-step process from grinding grain to bagging finished flours (anyone remember their mother making clothes from flour sacks back in the day?!). A few of the demos are hands-on, which are especially fun for all ages. When the millrace flood gates are opened, you’ll see and hear the powerful water-powered turbines in action! 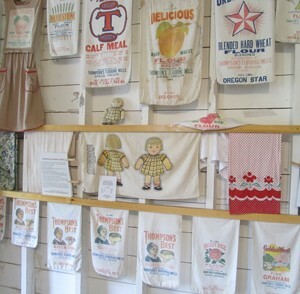 Anyone remember their mother making clothes from flour sacks back in the day?! War I, the mill operated around the clock to help famine relief in Belgium. In the 1940s, production switched from flour to animal feed primarily because local farmers shifted to growing grass seed instead of wheat. New regulations affecting food products also went effect at this time, and would have required new and costly stainless steel silos. In the 1970s, new owners not only continued to sell animal feed, they also sold electricity to a local utility company. Eventually demand for both decreased and the Mill closed. The State of Oregon purchased the site in 2004 and opened the 20-acre property to the public in 2007. 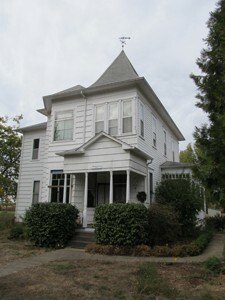 Although not open to the public, a 1904 Queen Anne-style home, carriage house and many out buildings are on site. Picnic tables and restrooms are available, but you’ll need to bring a few quarters for the poultry feed vending machines— that is if you want to make friends with the friendly chickens, ducks, and turkeys that roam the property. Keep your eye out for beaver, too, as they are frequently seen gnawing trees around the millrace. 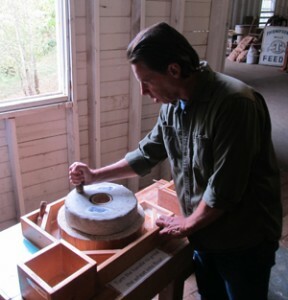 The Mill and grounds are open daily from 9:00 – 4:00. Free guided tours are offered every day at 10 am, Noon and 2 pm and last about one hour. 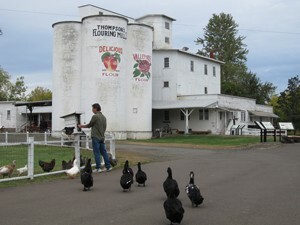 The Mill and grounds are closed on Thanksgiving Day, Christmas Day and New Years Day.